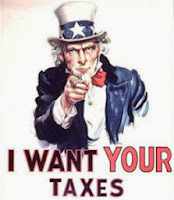 Sober Look: Why do we pay taxes? The following is an e-mail communication with Dr. L Brownstein of the University of Leeds in the UK. It is in reference to the post on student loans from a couple of days ago (here). Dr. Brownstein argues that the losses from defaults on the loan portfolio held by the federal government would not accrue to the taxpayer. This would mean that the taxpayer is not “footing the bill” on other losses such as Freddie and Fannie bailout, etc. It’s quite a counterintuitive statement because it begs the question of why we pay taxes at all. The answer – which works under the assumption that the federal government and the central bank are one and the same - is below. Thoughts, comments? Dr. L Brownstein: When you mention that the taxpayer is footing the bill, this is a macroeconomic error. To check this, have a look at Randall Wray's Modern Money Theory. Taxes don't underwrite government expenditure - they are irrelevant to it. Taxes serve other economic and social functions. Sober Look: Thanks for your comment. If "taxes don't underwrite government expenditure - they are irrelevant to it", why are we paying taxes at all? Dr. L Brownstein: There are a number of reasons to pay taxes. One is to legitimate the currency, as your taxes can't be paid in any other currency than the one legitimated by the government. This means that you have to use this currency and no other. Another function of taxes is to serve as an economic redistribution mechanism, which is a political function that sometimes works well and at other times not so well. At present, it isn't working well in this sense at all. A third function of taxation is to control spending, sometimes as an aid to reduce inflationary pressures. Whether this is the best mechanism for doing this is a matter of some debate. None of this has anything to do with supplying the government with money to spend. The type of economic system we have now is what is known as, and called so by Keynes, a fiat system accompanied by a floating exchange rate with foreign currencies. In a fiat currency system, money is created by government fiat, that is, ex nihilo, out of nothing. Should anyone else attempt to create this currency, they become counterfeiters. Where else can it originate? If the government creates all the money, then it must spend it before anyone has any of it to pay any taxes that might be owed to said government. In a deflationary situation in which we currently find ourselves there is a good argument for substantially reducing the tax burden for both companies and individuals. In an inflationary situation, this may be a good time, depending on circumstances, to increase taxes, which would hopefully calm economic activity. This means that a government with its own sovereign currency can never go broke. The US Constitution mandates the government to pay all its debts. Congress may interfere with this but this becomes a political issue. The US, the UK, Japan, and other sovereign nations with their own sovereign currencies are not like the members of the Euro, who have surrendered their own sovereign for a foreign currency over which they have very little if any control. Neither the US nor the UK are in the position of Greece or Spain. These countries can go broke. And, like California and other individual states of the US, must balance their budgets. There is no need whatsoever for a sovereign government to balance its budget, as it is under no economic constraints given that it is the creator of the currency in the first place. There are a number of consequences that flow from looking at the system is this way and I have no space to go into them now, so instead I invite you to read Wray's Modern Money Theory. This issue, among many others, is discussed there.